“Crazy” is PopMech’s choice of words, not mine. This seems eminently doable, though not without significant risk. We know how to make rockets work. We know how to make manned spacecraft work. 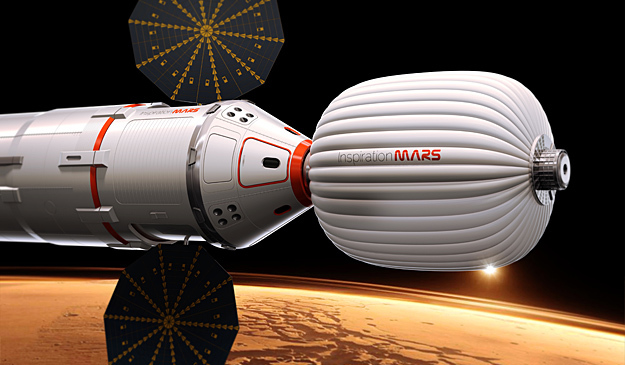 We even know how to make inflatable spacecraft work (just ask Bigelow Aerospace). What we don’t know is how to keep all of it working for nearly a year and a half with no chance for shipping spare parts. No doubt they’ll bring spare parts for the stuff they figure won’t last, but if something critical goes hard down they could be really screwed. Even though it’s a simple flyby, that’s how big things get started. Prove the concept, find what works, fix what doesn’t. If Inspiration Mars pulls this off, “historic” might not be big enough of a word. But enough of my bloviating. You’re better off reading from people who really know what they’re talking about.